Tears are responsible for keeping our eyes clean, lubricated and protected. Our tears are produced in glands called lacrimal glands, which are located above and toward the outer edges of the eyes. When we cry, especially when we cry for a long duration, these glands are overused and taxed. When the lacrimal glands become fatigued, they become swollen and unpleasant sensations may occur. The tissue around our eyes absorbs our saline tears, which may cause them to be puffy and irritated. Large quantities of blood fill our facial region when we cry, which may also lead to swollen flesh and pressure. 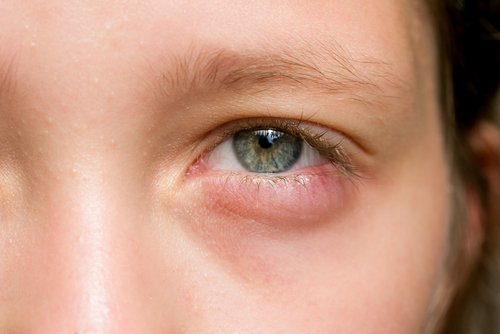 Understanding how and why our eyes become swollen from crying will help us address the symptoms with proper treatments. We may cry for a variety of reasons. Most of the time, tears are shed because of unpleasant experiences. Sometimes, we may cry ourselves into swollen eyes because of happy events. If this happens to you, then count yourself among a lucky few. During these times of emotional ups and downs, we often to not have the awareness to stabilize our emotions, but that is an important first step. After that most difficult of steps, there are many options to take to reduce the unpleasant sensations associated with swollen eyes. The first step is to return to the moment. This will be beneficial in reducing the amount of tears being shed, and it will also allow our minds to relax. If you find that you are crying uncontrollably, then take a deep breath and focus on your breathing. If the event has finished and you are not currently suffering new injuries or trauma, then try to immediately stop crying. When you inhale, focus on the incoming breath. When you exhale, focus on the outgoing breath. This will help you return to the reality of the moment. At this point, the salty tears are filling the tissue around the eyes. May may also be dripping down the nasal passageways. Many people may find that their nose is running while they are crying. An excellent first step is the wash the face thoroughly. Using cold water will also help your mind return to the moment at hand. Chances are, the real events of the current moment are not painful or harmful. Gargling with water will help to reduce the salinity and taste in the mouth. Run a towel or cloth under cold water. Remove the excess water and place it over the eyes for fifteen minutes. Lay down or lean back in a chair during this time. Take this time to continue to focus on your breathing and live in the moment. If the mind returns to the event, then turn your thoughts to what can be done about it instead of dwelling in the past. The best decisions are made with a calm, relaxed and rational mind. In cases where the cool cloth does not reduce the swelling, you can also use ice or cold metal. Be sure to wash any metal, such as spoons, if you recently have taken them from the freezer. This will reduce your chances of sticking to the metal, which is another problem entirely. This will help to cause the blood to leave the swollen blood vessels of the eye. Massages are wonderful, especially if you are dealing with a stressful situation. Softly massage the areas around your eyes and nose. This will relieve pressure in the area and help the blood and fluids diminish. If the crying has lead to a headache as well, then allow your hands to massage where it is needed. This is an excellent time to relax the body and do what is needed to reduce stress. Manage yourself in whatever way you need until you are relaxed and happy. At this point, you may be interested in taking a shower or a bath. In fact, each of the previous steps could have been in the shower, so feel free to experiment. A cool shower may help with the swollen tears, and a final warm up may help you to feel reinvigorated. Do not worry about shampooing or anything else, just breathe and enjoy the moment that you are giving yourself. Give your eyes the chance to relax and then move on to the stage of recuperation. Sliced cucumbers and strawberries contain nutrients that are beneficial in reducing the swelling in the eyes. You may also want to use tea bags to help draw out the salt that is in the area. Of course, you can also use lotions or rubs to help the situation. Take half an hour and empty your mind. This is a time to allow your thoughts to disappear and for you to be absorbed in the pleasure of the moment. Now that you are in a situation where your mind is relaxed and your tears are gone, take this time to make a plan. This will help to prevent future outbreaks of emotional turmoil. Determine what can be done and take action to remedy the situation. If nothing can be done, then allow the negative emotions to fade and instead turn the energy into something positive. Call a family member or close friend and share your thoughts and ideas with them. Remember that they may want to share their ideas as well, so give them a chance to speak their mind as well.